Who invented the Diesel Engine? The name of the person credited with inventing the Diesel Engine is Rudolf Diesel (1858 - 1913). 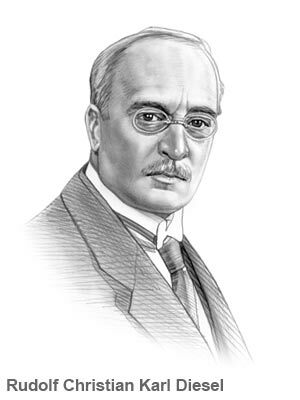 Rudolf Diesel is not only famous as the German inventor of the Diesel Engine but also as a mechanical engineer and businessman. When was the Diesel Engine invented? In 1893, during the Second US Industrial Revolution / Victorian period of invention (1850 - 1914). Definition of the Diesel Engine: The Diesel Engine is defined as a type of internal-combustion engine that has a very high thermal efficiency and a compression-ignition engine in which fuel oil is sprayed into the cylinder and ignited by compression alone. The Diesel Engine differs from gas or petrol engines which use a spark plug to ignite an air-fuel mixture. Definition of the Diesel Fuel: The fuel that bears his name is a heavy form of oil that originated from experiments conducted when the Diesel Engine was invented. It was later refined and perfected by Charles F. Kettering. Fact 1: Who invented the Diesel Engine? The Diesel Engine was invented by Rudolf Diesel in 1893 during the Second US Industrial Revolution era of inventions (1850 - 1914). Fact 2: Who invented the Diesel Engine? Prior to the invention of the Diesel Engine in 1893, the internal combustion engine which ran on petroleum gas, rather than steam, had been invented by Nikolaus Otto in 1876. Fact 3: Who invented the Diesel Engine? In 1886 the German inventor Karl Benz is credited with inventing the first true gasoline car and the Automobile Industry really took off sparking advances and innovations in the car industry. Fact 4: Who invented the Diesel Engine? The inventor of the Diesel Engine, Rudolf Diesel, was born on March 18, 1858 in Paris, France and died on September 29, 1913. Fact 5: Who invented the Diesel Engine? The early years of Rudolf Diesel were spent in Paris, France where he was raised by his family. He was the son of Theodor Diesel, a leather worker, and his mother was Elise Strobel. Fact 6: Who invented the Diesel Engine? Rudolf Diesel was educated at Technical University of Munich but was unable to graduate in his 1879 class because he was seriously ill with typhoid fever. He was sent to Switzerland to convalesce and during this period spent his time at the engineering of the Sulzer Brothers Machine Works in Winterthur. Fact 7: Who invented the Diesel Engine? Following his recovery from typhoid he returned to the Technical University of Munich and earned his degree in engineering. Fact 8: Who invented the Diesel Engine? His first job was working with Carl von Linde (1842 - 1934), his former tutor at Technical University of Munich, who had invented the refrigerator on 1876. Rudolf joined his engineering team at "Linde's Ice Machine Company" and within a year was appointed as director of Linde' ice making plant. Fact 9: Who invented the Diesel Engine? In 1883, Rudolf married Martha Flasche and the couple had two sons Rudolf Jr. and Eugen, and a daughter called Heddy. Fact 10: Who invented the Diesel Engine? Rudolf was fascinated by all aspects of new technology especially in relation to the development of the internal combustion engine which was pioneered by men such as Jean Joseph Etienne Lenoir, Nikolaus Otto and Nicholas Carnot. Fact 11: Who invented the Diesel Engine? Rudolf was particularly interested in the work of the French physicist Nicholas Carnot who had written a book on steam engines and produced theories on the maximum efficiency of heat engines. Fact 12: Who invented the Diesel Engine? Rudolf became convinced that he could produce a more efficient engine and in 1892 was granted a patent for his still theoretical design. By 1893 he had built a one-cylinder engine that used peanut oil as fuel. Fact 13: Who invented the Diesel Engine? In 1897 Rudolf introduced the first 25-horsepower 4-stroke one-cylinder compression engine which was displayed in the 1898 Munich Exhibition. His invention a new type of internal combustion engine with a compression ignition mechanism that did not require complex spark ignition systems. Fact 14: Who invented the Diesel Engine? He was granted patents for his design in Germany and other countries, including the United States. U.S. Patent 542,846 was granted on July 16, 1895 for the "method of and apparatus for converting heat into work" and U.S. Patent 608,845 on August 9, 1898 for "Improvements in Internal-Combustion Engines"
Fact 15: Who invented the Diesel Engine? Diesel originally designed his invention to use coal dust as fuel but was eventually reworked to use liquid fuel obtained from petroleum distillation. Fact 16: Who invented the Diesel Engine? The simple design of the Diesel Engine and its high efficiency made his invention an immediate commercial success and used to make diesel-engine locomotives and railcars, submarines and ships. It was not until the 1930's that the diesel-engines were used in automobiles. Fact 17: Who invented the Diesel Engine? The success of his invention prompted Rudolf to claim that his engines would replace all other forms of motive power including steam and gasoline engines. Fact 19: Who invented the Diesel Engine? Rudolf Diesel died on September 29, 1913 in the most mysterious of circumstances. He had boarded the steamer 'Dresden' en route to London to attend the Consolidated Diesel Manufacturing meeting, had dinner and retired to his cabin at 10pm. He was never seen again - he had vanished. Fact 20 - Impact: His mysterious death led to a variety of conspiracy theories including suicide and murder. The circumstances surrounding his strange death has never been solved.